Anyone who follows the trials and tribulations of higher education have little choice but to conclude the very foundations of Higher Education are being undermined. Higher Education and the intellectual integrity of the United States is being worried away by people and special interests who really don’t seem to appreciate the consequences of their actions. What they argue as being “choice” and “accountability” is little more than a wholehearted attempt to transform the current form of education in the United States into a commercialized, for-profit, corporatized version of the University of Phoenix, where the U.S. taxpayers and the very nature of our intellectual capacity are on the hook to shareholders and private investors, and potentially the 1%. This psychology degree is worthless. No one will hire me without a Master’s degree. What am I going to do with this degree in Art History? I can’t teach until I get a Ph.D! There’s no jobs for someone with a Creative Writing MFA. How am I going to pay back these student loans? Those aren’t truly failures of higher education. Those are failures of planning by people who spend more time researching what kind of car they are going to buy after graduation than they spend on researching the degree itself. If they spent 50% of the time researching their degree or chosen field they do in researching how to win the newest video game, or what type of car they think they will be able afford post-graduation, they would be much better off. No doubt, though, higher education has some deep-seated issues, behaviors, traditions which could stand some changing. I see many of these traditions every day, poor workflows, stumbling bureaucracy, recalcitrant leaders, ineffective leaders, calcified thinking. Higher education needs to be nimble, quick-thinking, light-on-its-feet, yet grounded in the principles of discipline and intellectual fortitude which people expect. Higher education cannot be nor should not be thought of as a “machine” into which raw materials enter and a finished product exits. One trait higher education should impose on graduates is higher level thinking, better tools for reasoning, for logic, and for decision-making. Among the opponents to higher education I count Scott Walker, Gov-Wisconsin. Gov. Walker is an individual lacking in the intellectual capacity to contemplate the very nature of higher education, the pursuit of intellectual problems, the freedom to express intellectual curiosity, and certainly opposes any taxpayer supported research. He seems to think employees of higher education are lazy, at best, and parasites, at worst, sucking the life-blood from the U.S. taxpayer, contributing nothing yet costing Wisconsin taxpayers. I’m rambling. I have some legitimate concern too many people share Scott Walker’s perspective. People seem to misunderstand their experience in college doesn’t really prepare them to be a critic of higher education. No one would think to criticize the autoworker who assembled their Toyota simply because they drive a Toyota, yet for some reason college graduates think their college experience prepares them to criticize higher education. Their experience may grant them permission to judge their Greek System, perhaps their student government association, perhaps even their student loan office, yet they commit a logical error in extrapolating their experience into all areas of campus. Even within a college or university, employees are guilty of extrapolation errors. Simply because the student loan office appears incompetent, all office then become incompetent. Or Accounting. There do exist people who whose workflow brings them into interaction with multiple offices, agencies, and departments on a college campus. We call these people, “secretaries.” These are people tend to be the true workhorses of any college. They know how to make the bureaucracy function even when policies are in place to make everyone’s life difficult. They work their asses off, year-round, too. The technical staff at most colleges and universities also work their asses off year-round, too, sacrificing weekends and holidays in order to keep web sites, networks, WiFi, Active Directory, email, software licenses, computer labs functioning and up-to-date. They work early mornings and after-hours to ensure the university’s circulatory and nervous system is healthy. Most of the time, no one sees us, or have no idea what we are doing behind the scenes to make faculty and other staff’s lives easier. Every once in a while, one of us will get recognized, during a staff luncheon or other meeting. We may look bashful when singled-out; we know we have to rely on others in order for us to get our jobs down. Technical jobs are a team effort at most colleges. We have to work in concert with others. When technology works well, many people had a hand in the implementation, most likely. Much of what I do relies upon the efforts of my university’s technical staff, our information systems office. I handle everything from the network jack out, for the areas I am responsible for. In my areas, I am a one-man, one-stop shop for many jobs. But, the work going on behind the scenes our IT staff accomplishes allows them to distribute some of the work-load on technically capable people in other work areas. And, we work year-round, Thanksgiving, Christmas, summer break, winter break, snow days, birthdays, etc. And, sometimes, we do work outside of our documented job responsibilities. Nine, 8ft x 3ft I made this summer, using imagery from NASA’s Earth Observatory and raw Landsat 8 imagery. I elected not to use our image processing software for handing the imagery. Instead, I decided to use GIMP and figure out how to manipulate the satellite imagery using a graphics package. Final layout of the banners used Corel X6. I also used a handy free app, Paint.Net. A considerable amount of review and proofing occurred, plus I had to educate myself on GIMP, download Landsat 8 imagery for western Kentucky, Beijing, China, and Istanbul, Turkey. I also grabbed some National Airborne Imagery Program (NAIP) imagery in order to provide a graphic of a truly important archaeological site in Louisiana one of our faculty has worked at for a number of years. Lots of good stuff. In addition to creating these promotional banners, which took about 2 weeks, I managed to sneak in some other departmental upgrades. With some monies I had from a program I helped develop, I bought a couple of 48″ Samsung Digital Displays SmartTVs. These digital displays come with a selection of templates to assist users in getting content pushed out to an audience. In the image (left) I have created a rotating series of Landsat 8 images to – hopefully – captivate my audience, students standing outside classrooms waiting to gain entry and have their brain cells stimulated by new and wonderful knowledge. These displays can be connected to the university network, can handle JPGs and Powerpoints, and can play video files in a few different formats. I plan on using these displays to attract an audience, education the audience about the discipline of Geosciences, and promote different departmental activities and research. In the meantime, two of these ©SMART podiums arrived, along with brand-new data projectors. 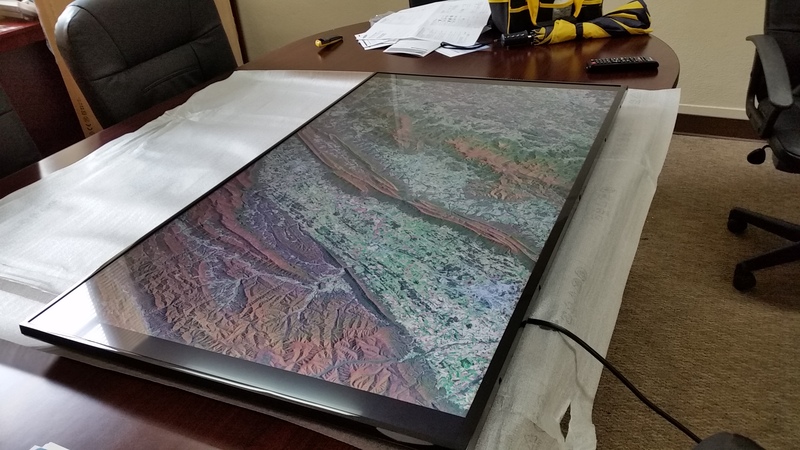 Years ago, we invested in a number of ©SMART Smartboards. These big white board allowed data projector images to be displayed, a set of colored pens could be used to draw across the images, the entire process captured to a JPEG, TIFF, or PDF and saved for later, perhaps to be included in a set of notes posted online. The Smartboards proved very popular among faculty and students. They could be adapted to for use with USB which kept them alive longer. When we updated to Windows 7, I believe SMART opted not to carry drivers forward beyond Windows XP, leaving a large user base with almost useless whiteboards. There are lots of competing technologies available today allowing educators to use current dry-erase boards as a lecture capture medium, though. Also about 10 years ago we were handed down a couple of ©SMART Podiums. These initial Podium versions essentially captured all the potential of Smartboard yet on a digital display. The pen could be used to write notes, draw, or drive any application just like a mouse. Every thing performed on-screen could be captured to a JPEG, TIFF, HTML, or PDF. Faculty really found the Podium useful, especially those teaching software, or wanting to annotation Powerpoints on-the-fly. The new Podiums (SMART Podium) I chose to invest in are much larger, about 24″ wide, with 3 USB ports, HDMI, DVI, and VGA ports. If you are familiar with any of the Wacom graphics tablets used by professional designers, artists, and cartoonists, the Podium is essentially that. The pen senses varying amounts of pressure, can drawn colors from a large palette, and has a large symbol library. SMART also include a large collection of clip art for use in enhancing presentations. I serve about 14 faculty, more or less; sometimes I have to include faculty from Biology or Chemistry, or at least consider their teaching needs when I perform classroom upgrades. Initially, my plans were to install the Podium/data projector combo in a teaching computer lab. 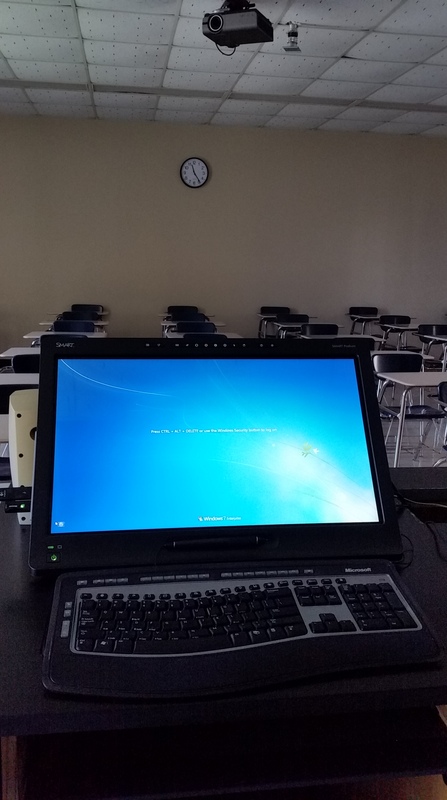 I had more requests for installing the new tech in a typical lecture classroom, thus a Podium was installed in a 40+ seat classroom. Sometimes, I have to be the sound guy, the Geosciences “roadie.” We have a lecture room with stadium seating capable of holding maybe 180 students. 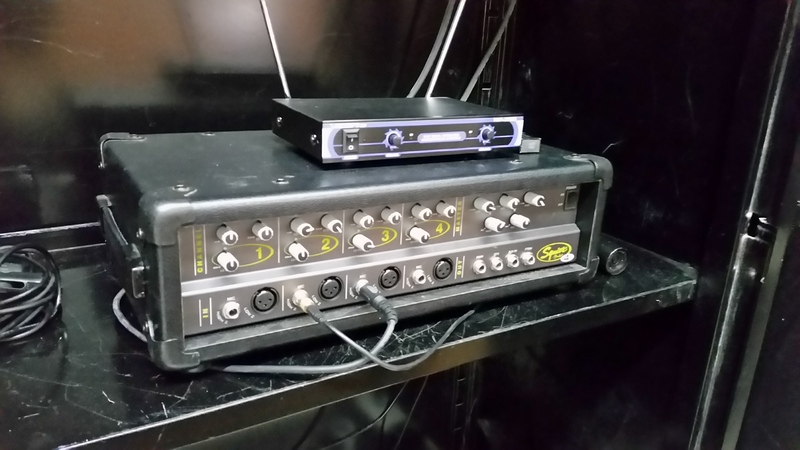 The room rarely sees maximum capacity but we have two Squire speakers, a wireless microphone system, and an amplifier to help blast knowledge and wisdom and critical thinking skills into the brain cases of today’s youth. This summer I had to reroute my wiring from last year, clean up some cabling issues, and make access the equipment more convenient. We are working with cabinets and fittings and such circa 1950, and doing so requires making modifications. Watching episodes of “This Old House” and “The New Yankee Workshop” has really paid off, let me tell you. Finally, I mended this old table. 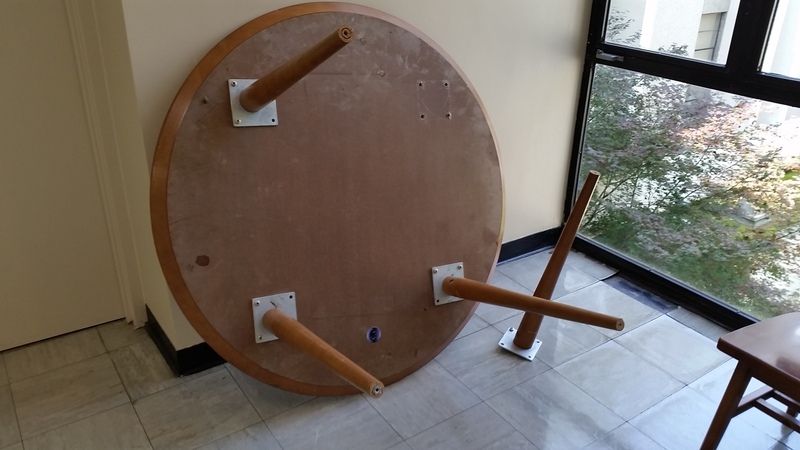 I’m not going to go spend money on furniture if I can spend $6 on some hardware to repair a table. I did repair this table; the image (left) is a “before” image. I’m going to leave the “after” image to your imagination. Some tasks don’t translate well into graphical form. For example, I wrote a script to silently install ArcGIS 10.3.1 onto computers. But, in order to do this I needed a script to silently uninstall ArcGIS 10.2.2 from those computers. Better this than to sneakernet a USB drive around. Now, you could say, “Why don’t you image your lab, then push your image back out?” This lab is a small 24-seat lab and to build an image and push said image back out might actually take longer than the process I have, especially when I can execute the uninstall and install script across a network. Early in the summer I also conducted a 1/2 day workshop for teachers. I discussed those details in my last post, “Geomentoring for Teachers,” so I will save you those details. And there have been various and sundry other tasks, like arranging a regional meeting for members of a state-wide mapping association (failed), planning for an archaeological society meeting (failed), assisting a student with an ESRI Virtual Campus course written for an earlier version of the software than he had installed on his laptop, and designing departmental t-shirts for sale as a fund-raiser. In a few weeks, faculty will return to campus. They will have needs and expectations pertaining to their classes, their classrooms, and technology. Me, too. I also teach 6 hours of course work per semester, sometimes more, rarely less. One semester I taught 21 hours, and I’m an adjunct. In a few weeks, I’ll have to prepare for my own courses, plus assist faculty with their courses. Actually, sooner, as I need my courses prepped and ready about the time faculty return otherwise I can’t get my courses published on-time. My point in providing these details is first and foremost not to ask for recognition for anything. My intent is first to convey information about what people in academia do over the summer. Many of us work our asses off to ensure classrooms, technology, and other details are ready for the fall semester, or the spring semester, or maybe the winter semester. Every semester, but especially the fall semester. Many of us have family members who, despite having known what we do, still state, “Oh, you have summers off. You need to come and mow my yard and paint my house and bathe my dogs each week.” And, we have to say, “Look, I’m sorry, but I don’t have summers off. I have a 12-month contract. I’ve got to clean up from the last academic year, upgrade and update some things, and prep for the next school year. I can come visit for a few days, maybe mow, but your dog doesn’t need to be bathed that often. Not good for them.” I’m attempting in my own small way to reveal what goes on within these little isolated communities we call “universities” during the off-times and provide people some insight, and lessen ignorance of the university workplace. Some faculty have 9-month or 10-month contracts. Their wages/pay periods are crammed into 9 or 10 months, and they account (hopefully) for the months they go without pay. Some colleges allow faculty to spread the salary across the non-contract months. However, most university employees, myself included, work 12-month contracts. And work we do. To Scott Walker and his acolytes I say, you really have no idea what you’re against. Cutting higher education improves nothing, and in fact, cuts the head from the body to spite the hands, or feet, or really to spite the rest of the body, I think. Education pays considerable dividends to those who choose their educational route wisely. And many of us in higher education really do put in hours well past those we get paid for to ensure people, i.e. students, get a good value for their time and financial investment.